Incoming Rep. Alexandria Ocasio-Cortez's visit — and high-fives — with climate protestors at House Democratic Leader Nancy Pelosi's office shows both energy and fault lines on the left over how ascendant House Democrats should approach the topic. 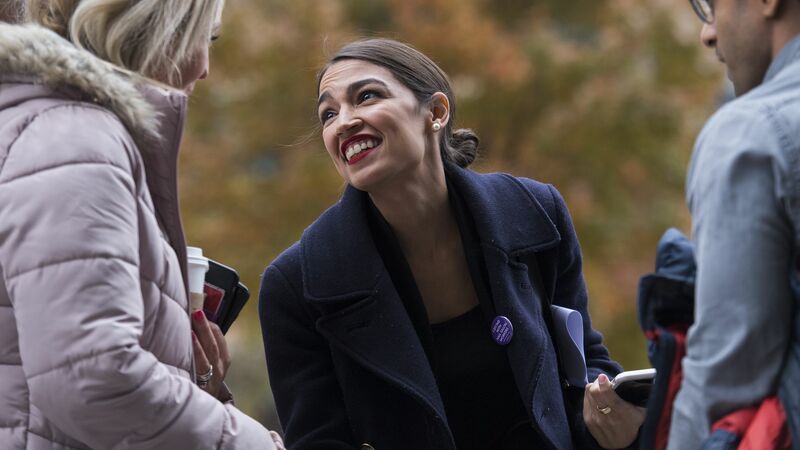 Driving the news: Ocasio-Cortez, a rising progressive star, attended the demonstration yesterday by young climate activists with the Sunrise Movement and Justice Democrats. "This is about uplifting the voice, and the message, of the fact that we need a green New Deal and and we need to get to 100 percent renewables because our lives depend on it," she told reporters, according to several outlets. The intrigue: Pelosi is already planning to revive some iteration of the select committee on global warming that she set up when Democrats last controlled the House. But while Ocasio-Cortez welcomed that move, she's calling for steps that go well beyond what Pelosi has committed to doing, at least thus far. Details: The incoming New York City Democrat, backed by the activists, is circulating a resolution establishing the panel that would give it legislative power. The resolution instructs the panel to craft sweeping clean energy and climate legislation (the "Green New Deal") by early 2020. It would require 100% of national power to come from renewables and includes other ambitious energy and industrial decarbonization goals and efficiency measures. The document says the panel should have wide latitude to construct a federal funding plan, with options such as new public banks devoted to it, public venture funds, and other options that the committee "deems appropriate." But, but, but: The prior iteration of the committee had no power to write legislation, and Pelosi's office yesterday did not respond to an inquiry on that question. Pelosi would likely face pushback from senior Democrats about to take the gavels of existing committees if she handed legislative powers to the climate panel. What they're saying: Politico's Anthony Adragna reports that Rep. Frank Pallone, the likely incoming chairman of the Energy and Commerce Committee, doesn't think it's necessary to revive the climate panel at all. "We have great people who want to take action on climate change who will be chairing the committees of jurisdiction," he said. On the substance, look for Democrats to include provisions on low-carbon energy and climate resilience as part of an infrastructure package, which Pelosi mentions in her statement responding the demonstration. Where it stands: Ocasio-Cortez, in comments to CNN and elsewhere, emphasized that her participation was not a confrontation with Pelosi. But it's far from clear if Democratic leaders have interest in pushing a sweeping climate bill, especially as they seek to keep their focus on oversight of the Trump administration.